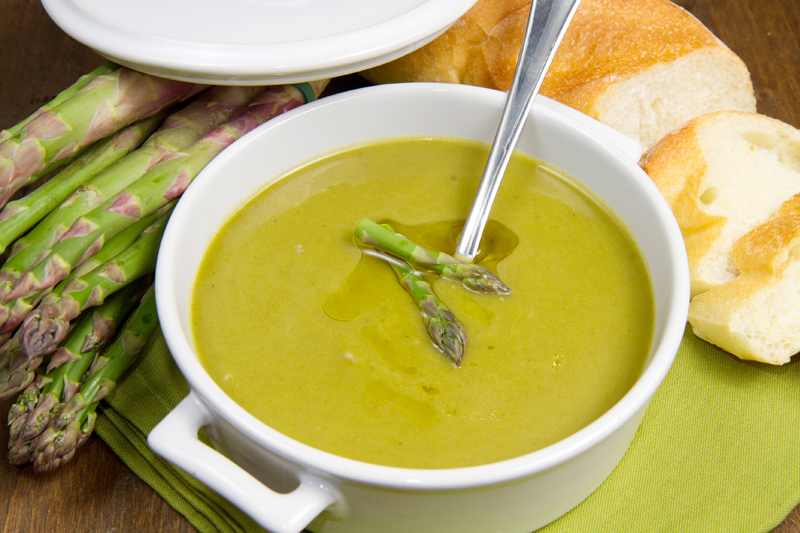 Asparagus makes a deliciously rich and creamy soup that pairs well with whole grain crackers or hearty, crusty bread for an incredibly satisfying meal. In a Dutch oven or large saucepan, heat the butter over medium heat. Add the leeks and cook, continually stirring until soft, about 3 to 4 minutes. Add the garlic, and stir until fragrant, about a minute. Add the broth, asparagus, and basil. Increase the heat to high and bring the mixture to a boil. Reduce to a simmer and cook until the asparagus is tender; about 15 minutes. Pull out a few pieces of asparagus and place them in ice water to preserve their color and use as a garnish if desired. Remove the soup from the heat and stir in the milk and lemon juice. Using an immersion blender, blend the soup until smooth. Keep the soup warm over low heat. If you don't have an immersion blender, puree the soup in batches by ladling small amounts at a time into a blender or food processor, blending until smooth. *Be sure to remove the woody root ends of the asparagus before cooking. Do this by taking the end of the asparagus between your thumb and forefinger and bending it until it breaks. The asparagus will automatically break where the woody part ends, and the fresh, tender asparagus begins. So don't worry about breaking off too much or too little.